Cruising with a Pet | Have More Fun. Get Boativated! More and more we meet people who cruise with their pet, usually a dog. 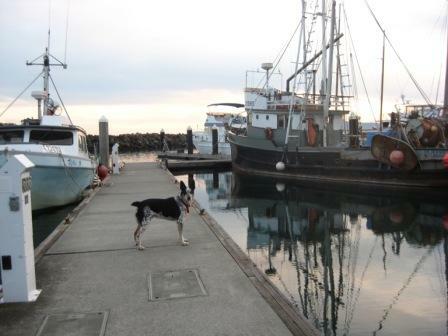 Our dog T.J. (named after Tristan Jones) has cruised with us for seven years, including a trip around Vancouver Island. Its great fun but having a dog on board introduces another element to the cruising experience. T.J. is now an experienced cruiser and he is a great companion. When you are cruising with a dog, especially a smart one, you must remember that every interaction with him or her is a training experience. Dogs spend their lives observing us and they learn from our behavior. They are learning all the time, even when we might not know we are teaching. There is no single “best” breed of dog for cruising. We have seen many different breeds (and mixes). However, based upon our experience it helps if the dog is smart and it is very important that the dog be trained and obedient. There are times when it is necessary that the dog obey commands immediately (just like any good crew-member) and there are times when the dog needs to sit and be quiet. Before we took T.J. cruising we all attended obedience and training classes. Plus, we bought and rented training DVDs and we watched the “Dog Whisperer” on TV. Then, we took T.J. on a few shorter “shake down” cruises that were easy and uneventful. This gave him a period of adjustment to the boat without any traumatic experiences. We also worked with him to teach him to pee off the bow of the boat. This is probably the single most important “talent” for making cruising easier. It means we do not have to go ashore before going to bed or first thing in the morning, or during rain storms or rough weather in an anchorage. We carry various dog toys and we keep some big “knuckle” bones in the freezer that we can give him to work on when we have a long day. We also visit places where he can go ashore and walk or play to blow off some energy. Some dogs are active (T.J.) and they are happiest when they have a chance to run, swim, or play, every day several times. In areas where he has to be on the leash we take him for a nice long walk. 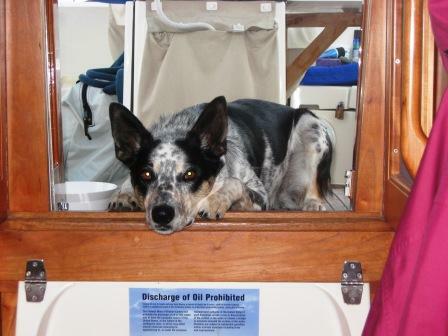 There are several things you can do to have more fun cruising with your dog. Be sure you have some things for him or her to do on the boat. Bones or chew toys are great as are various dog treats and toys. We have found that the “Kong” toys are really good because they allow the dog to work to extract treats from the toy and satisfy an instinctual drive to get food. Also, it is a good idea to have a life-jacket for your dog (with a handle on the back) so you can lift him from the water when (not if) he falls in. Just like a person, falling in the water can be a terrifying experience for your pet and if you are able to make a quick, no-panic rescue by just lifting him back into the dinghy (or back onto the dock or boat) the incident will not cause your dog to be fearful in the future. We love cruising with our dog but its definitely not for everyone or for every animal. However, if you take the time to train your pet and yourself and to start him/her slowly, everything will work just fine.